If you’ve decided you need a good Learning Management System (LMS) to help your organization meet its goals, you may have signed up for a free trial from another company. It’s possible that experience didn’t go particularly well. Why? Free trials can be a decent way to try out some kinds of software, but a good LMS is custom tailored to meet your company’s needs — and a free trial simply cannot replicate that experience. Prosperity is customized to fit your needs exactly, following best practices, and we provide the training and support to make sure you get what you want and need from our system. For more personalized information about this process, contact us. If you’re considering trying a free trial, you should be aware of the many potential pitfalls that will make a true evaluation difficult. Free trials give you only a limited amount of time — but an LMS that works for your unique needs requires hours of training and setup time. 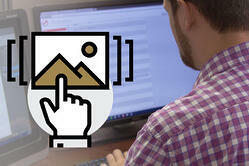 Will you have the time to learn the workflows and really delve into the features of a system? More importantly, will the time you and your team put into learning a system during a free time end up being wasted effort if the system doesn’t meet your needs? Perhaps you’ll settle for a less-than-perfect solution exactly because of the extensive time and effort put in to a “free” trial. But, obviously, LMS providers can’t devote the resources to design the system you really need if it’s just for a free trial that you might walk away from. The unfortunate issue is that free trials often end up wasting the time both of the customer and of the LMS provider. It is a wholly inadequate approach to achieving the kind of positive results a well-designed, properly set-up LMS can deliver. Prosperity delivers. We can set you up with a system that does what you need, meets your exact requirements and meshes perfectly with your company’s culture and personality. We offer a fully supported setup, a dedicated implementation team and personalized training sessions. We’ll provide you with the technical resources, training and assistance necessary to build the perfect LMS for you. Contact us for more information. Free trials can be seductive, we understand. It may seem like a way to test drive a system to see if it can meet your needs. But the downsides, while not always apparent, make a true evaluation impossible. For example, if you need a reliable LMS that helps you manage compliance certifications, you'll want to test features like auto emailing and automatic tracking of different sets of data. Perhaps you want to track who needs what certification and what employees have taken certain courses. To truly test that new system, you need to take the time to input data and run actual tests. When you work with Prosperity, we will start with your goals and objectives and build a system that will make it easy for you to get what you need from the software. You won’t get that from a one-size-fits-all free trial. If you’re going to put the time and effort into setting up an LMS, it should be one you know from the beginning will do exactly what you need. (You can download our LMS Checklist here.) Prosperity can promise that because we customize each and every instance of our software to meet the customer’s individual needs. 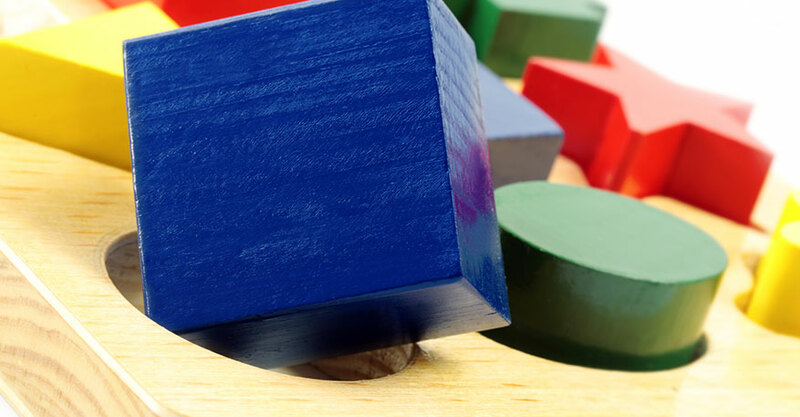 You want your LMS provider to understand your company’s unique needs and provide a platform that helps you close gaps and streamline operations. 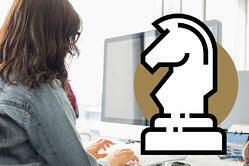 You want an LMS provider who will be a full partner in your success. We will be that full partner. We'll adapt our system to meet your needs and provide you the training and support you need to be successful. We are committed to a lasting relationship where you are totally satisfied with the end product. So, contact us to set up a 30-, 60-, or 90-day pilot of our Prosperity LMS. Test drive our system to make sure you get what you want and need from our system. 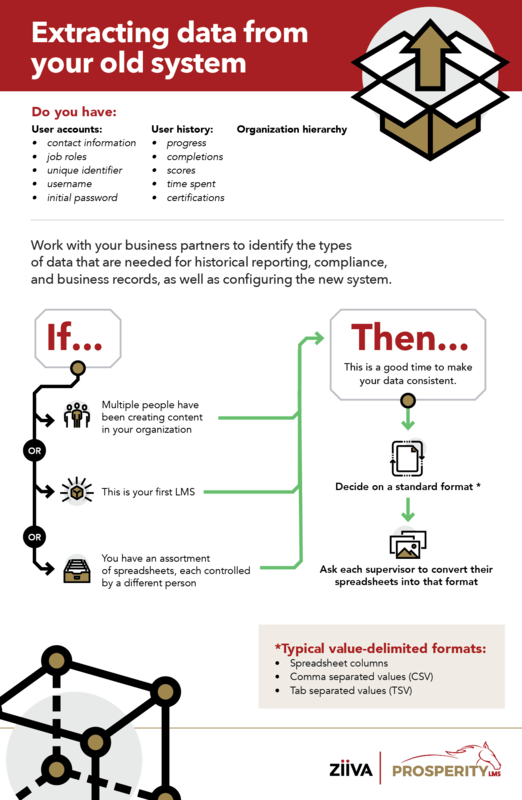 After you get your content off your old system and onto your new LMS, it’s time to extract your data. We believe it’s imperative that you have access to your user data and history at any time. In order to ensure consistent access, make sure your new LMS provider will either have the tools available for you to extract this data yourself, or provides regularly scheduled exports and updates. Is on-premise, perpetual licensing right for you? 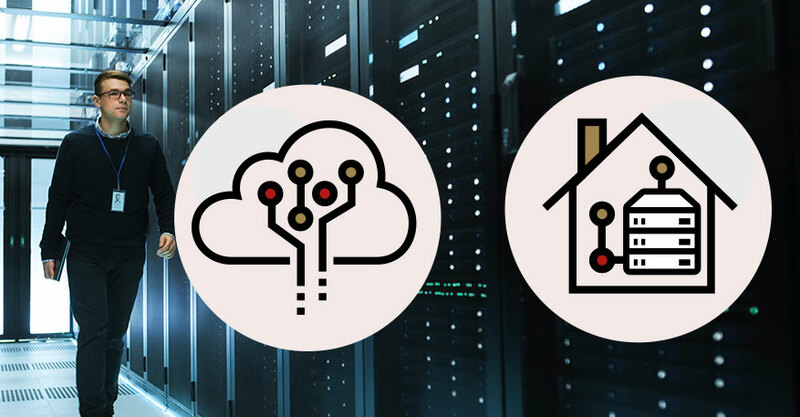 You may already be familiar with the difference between cloud-hosting and on-premise hosting, and have heard about the overwhelming trend of organizations moving to the former. The learning management industry is no different; according to a 2015 Capterra study, 87 percent of respondents use a web-based LMS, while only 13 percent have an on-premise or installed system. But this doesn’t mean cloud-hosting is the best option for everybody. As is true with so many of the features and capabilities of an LMS, it depends on what you’re looking for. Hosting an LMS on premise has advantages that can be overlooked and undervalued in the mass exodus to cloud. There may be few LMS providers who offer this option, but many organizations need it. In this blog post, we dive deep into on-premise hosting—what it is, what its benefits are, and who are the best candidates for this LMS hosting option. What is an on-premise system? An organization will buy the LMS system up front, and it’s theirs forever— hosted on their local systems or with third-party hosting. 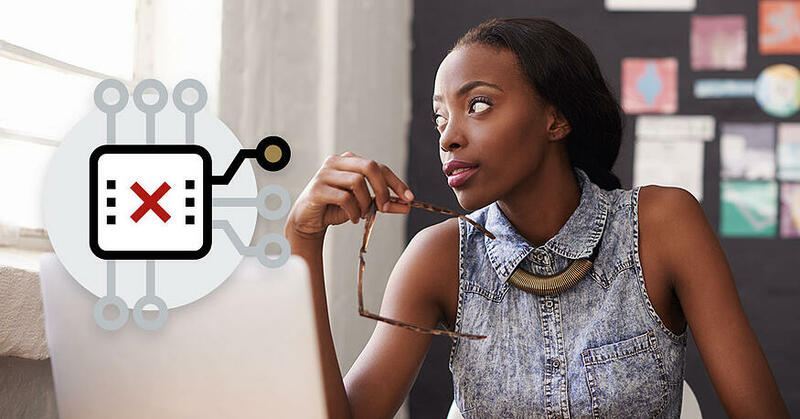 They have the option to pay the LMS provider for annual maintenance to get tech support, updates, and upgrades, but many have internal IT teams to cover this. Perpetual licensing is another associated term, and it refers to when an organization purchases the LMS license. This option is a popular model for self-hosted, on-premise installations of enterprise software. Companies who want on-premise hosting for their LMS (banking, financial services, government agencies, etc.) are usually looking for controlled environments to store proprietary or sensitive information. An on-premise or self-hosted LMS can be the answer when your organization demands strict control over upgrade and release schedule to meet requirements such as 21 CFR Part 11 regulations or ISO requirements. With on-premise hosting, you can use the LMS however you want and customize it endlessly (although you will need an LMS core platform that has that kind of flexibility). When you’ve got the LMS license, there is no limit to the number of users on your system, and there’s no cost to add more. With self-hosting, your LMS lives at home (or on a private server), which means it’s in a predictable server environment. No changes (updates, overhauls, maintenance, etc.) will be executed without your say-so, and all data and operations stay behind your firewall. With an in-house server, your IT team minimizes downtime and schedules maintenance based on your schedule. If you already host other management software (talent management or HR), the implementation and integration of one more system is relatively easy. No LMS user works alone. Parting ways with your Learning Management System might affect your whole organization. Consulting your colleagues before making the transition to a new LMS will make the move easier, because they are going to have concerns, requirement, and many questions. But the priorities will differ from department to department, and so will the concerns. Corresponding with employees/users about progress, deadlines, etc. Your training department will have valuable input for the LMS buying decision. If an LMS is working right, it is offloading and automating many administrative tasks, easing the burden on overwhelmed training personnel, and enabling them to be proactive rather than reactive. How do I create courses in the new system? How long will it take me to feel comfortable using a new LMS? We have some unique needs — will the new system be able to meet them? What reporting features does the new LMS have? How do I administer exams and track results? Will I be able to change features I don’t like? Is there a support team that I can ask for help? What security issues will a new LMS introduce? Will I be able to securely transfer data to a new system? How? Will I be able to extract my content off this new platform? How? Do I get FTP access to the new system? How will I move user account information? How much customization is available? Will the new system integrate with our workflow (billing service, classroom portal, project management tool, marketing platform, etc.)? How much maintenance and on-going administration will be necessary? What’s the estimated start-up time? Will the new system provide end-user tech support? Managers typically make the final call on the breakup (is it you?). They’re looking at bottom lines, but they are also aware of how an LMS affects the working environment—both negatively and positively. Will a new system help us sell our content faster and more effectively? How will the new system differ from the old one? Will it be better? Does it offer flexible pricing (prepaid course codes, pay-as-you-go, etc.)? Will the new system collect data about users and potential customers? Will it be easy or difficult to comply with the 2018 GDPR regulations? Will it meet our unique business requirements? What cost/time savings will it bring us? Don’t forget the end users! Changing your LMS will affect the learners who depend on the system to deliver and support courses. If they won’t use the system, the system won’t work for you. Does your new LMS offer end-user tech support? What is your change management plan? How and when will you prepare your end users for the transition? Will we need additional training to use the new system? Transitioning to a new LMS will be smoother when you have the support of everyone involved. This can, however, take some effort. The Balance, a financial empowerment firm, offers some additional tips on reducing employee resistance to change. 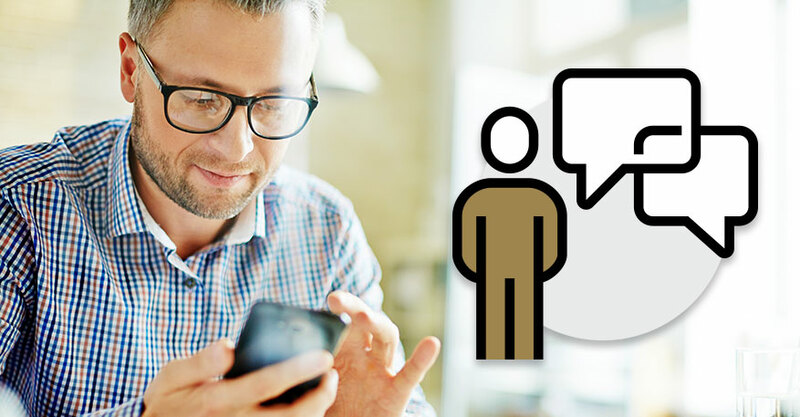 Include your potential new LMS partner in these conversations. One sign of a strong LMS partnership is a willingness to engage with and competently speak to all levels of concerns. Leaving your LMS is like breaking up. In the end, the decision may come down to how well your system helps you improve people’s lives and jobs by sharing the knowledge and skills they can use. If your LMS is not helping this mission, it may be time to break up. When something has made you continually unhappy or unsatisfied with your current system, you contemplate ending the relationship and moving to something new. 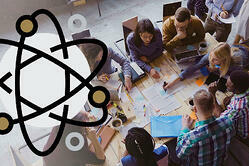 Transitioning to a new LMS will involve your whole team. You may have made the decision to change, but now everybody needs to be cheering on the new LMS. Make a pact as a team to give your new LMS a honeymoon phase, when you appreciate its finer points while adapting to a new system. Challenge your team to fully understand how the new LMS accomplishes a task before comparing it to the old system. The support of your team and its ability to embrace change will create a much smoother transition. The Balance, a financial empowerment firm, offers some additional tips on reducing employee resistance to change. Learning a new system involves more than attending a training seminar or reading a handbook. It requires engaging with the application over time. 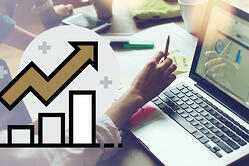 In addition to ensuring your team is trained on the LMS, emphasize that it must be used often. If you allocate time each week for your employees to work with the new system, their learning curve will be shorter and the transition smoother. Happy employees engage with their LMS on a regular basis. They know their results depend on their effort, so they take the time to learn. Some businesses come to us concerned about adopting a new LMS because of retention problems—which are the greatest concern for business leaders in 2017, according to a study by Future Workplace and Kronos. They are in a cycle where turnover is high and tenure can be shorter than the time it takes to become proficient in their LMS. In our experience, those companies are happily surprised to find that retention improves when employees are trained on an LMS that fits their needs. Getting your employees properly trained increases job satisfaction and reduces turnover. The vicious HR cycle can be broken, but engagement with the LMS is key to success. At first, your new LMS may feel unfamiliar and uncomfortable. You won’t know where to find that button or how to track that class. You might feel frustrated and even miss the familiarity of your old system. According to Learning Solutions Magazine, it can take from six to 12 months to get fully comfortable. 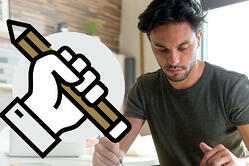 Then it happens—with time and practice, you become a power user of your new LMS. The new system meets your initial needs, and then fulfills those other, unforeseen requirements that always appear. 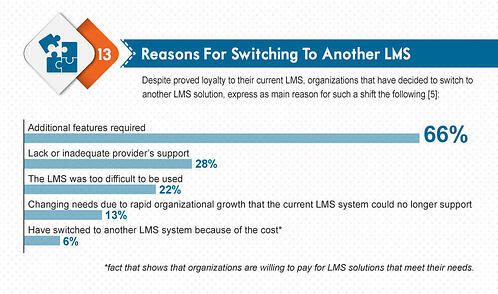 These additional features are the main reason organizations make an LMS change, according to eLearning Industry. When transitioning to a new LMS, questions will arise. Some of your team members will learn from the manual, others will need training sessions, and others will do best through trial and error. Your new LMS should accommodate different learning styles, and offer long-term support. Poor customer support is a common reason organizations change their LMS, according to Training magazine. If you dreaded picking up the phone or asking for a new functionality with your old LMS, knowing it would end in a large bill or unresolved issue, make sure such support is a requirement with your new provider. Make sure your LMS provider knows who you are. This will significantly shorten your transition time and increase your satisfaction with the new system. Even if you are accustomed to having to rattle off an account number or explain your problem nine times each time you call LMS support, make sure it’s a different experience this time. You deserve a dedicated trainer, customer service representative, and account manager, who are ready to assist you. You want them familiar with your setup and focused on your project, so that you can get straight to the point each time you call. This familiarity also creates a smooth transition from your LMS implementation team to tech support. If six months later, you can’t remember something from training or you finally start using a feature, you’ll know whom to ask and be sure he/she will remember your case. Focus on what you have to gain. The return on your investment won’t be measured only in dollars, but also in a happier team, happier clients, and simpler processes. This makes it possible for you to achieve your team's goals—making sure your learners get the knowledge and skills they need.